The Marin Chapter of the California Native Plant Society (Marin CNPS) will present a special exhibition of photographs entitled Beauty and the Beast: California Wildflowers and Climate Change, featuring over 70 wildflower portraits and native landscapes by Marin City photographers Nita Winter and Rob Badger. The breathtaking photographs address climate change and its effect on a universal symbol of beauty: the wildflower. The show runs April 2 through June 1, 2019, and is open to the public Tuesdays through Saturdays 9am – 4pm at Sausalito’s Bay Model Visitor Center (2100 Bridgeway, Sausalito), with an opening reception on Saturday, April 6th from 1–3pm. Admission is free. The photo exhibition and additional planned events and activities throughout April and May are being sponsored by the Marin Chapter of the California Native Plant Society to help Bay Area residents understand what may happen to our exceptional local biodiversity with the increasing effects of changing climate conditions. Saturday, April 13. SPRING NATIVE PLANT SALE. Falkirk Cultural Center, 1408 Mission Ave, San Rafael; 9 am–1 pm. Special focus on California wildflowers; free talk at 10:30 am on growing ephemeral wildflowers. Wednesday May 22. SPEAKER. Talk on Restoring Plants, Soil and Water: Nature Wants to Help by Judith Schwartz, Environmental Journalist. 7 pm with book signing afterward. Bay Model Visitor Center, 2100 Bridgeway, Sausalito. 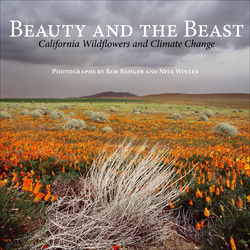 For more than 20 years, international award-winning photographers Rob Badger and Nita Winter have worked to capture California’s vanishing wildflowers, bringing awareness to the beauty of the Golden State as well as to the dangers facing our natural habitats from climate change. The exhibition emphasizes Marin’s landscapes but also includes diverse geographic regions of California, from Sierra alpine rock gardens to Death Valley’s desert scenery. Beauty and the Beast: California Wildflowers and Climate Change is sponsored at this venue by the Marin chapter of the California Native Plant Society with support from the Buck Family Fund of the Marin Community Foundation and from Marin Municipal Water District. The exhibition originated at the San Francisco Public Library and is traveled by Exhibit Envoy. The non-profit California Native Plant Society is a leading voice in plant science and native plant conservation, working to increase the understanding, enjoyment, and horticultural use of native plants throughout the state. The organization works closely with decision-makers, scientists, and local planners to advocate for well-informed and environmentally friendly policies, regulations, and land management practices that protect and enhance our native flora.